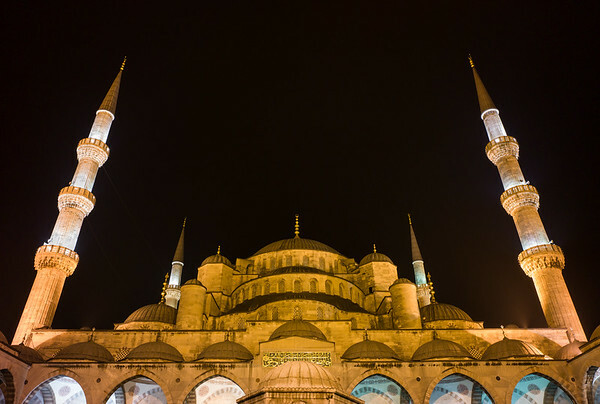 The Sultan Ahmed Mosque, more popularly known as the Blue Mosques, is one of those structures that I wanted to photography for hours and hours. Even then I would frequently find myself simply staring at it, or studying one small piece in detail, rather than taking pictures. I found it to be a structure that drew me to it, captured my attention, and wouldn't let go. Thankfully, the complex is open for most of the day, and I could go in at night to photography it from different angles without worry that I'd be in the way of worshipers or tourists. 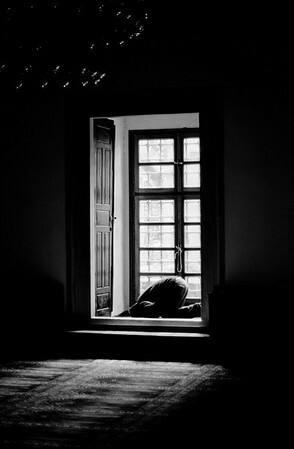 The mosque is simple yet detailed, delicate yet robust, all at the same time; it just depends on where you look. 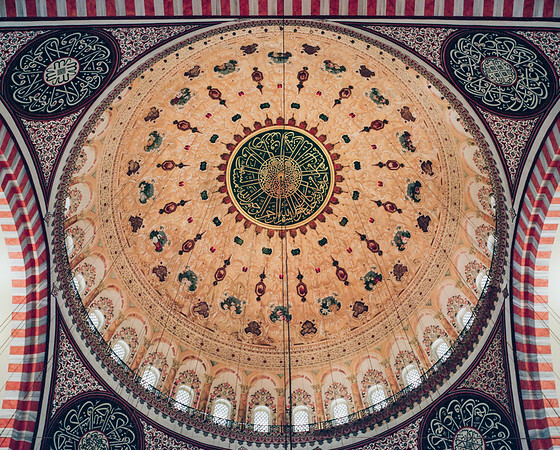 This image shows the main dome and four of six minarets. One of the greatest surviving examples of Byzantine architecture, the Hagia Sophia, is one of Istanbul's major attractions, and rightfully so. Having landed just hours before, I didn't let a little think like jet lag slow me down of my first day in the city that spans two continents. Though it proved a bit challenging to get into the Hagia Sophia (I had to check my tripod and have my bag searched a few times, I was rewarded with incredible architecture, great mosaics, and an overall moving experience of being in a structure that has served as a church, mosque and museum over 1,600 years. 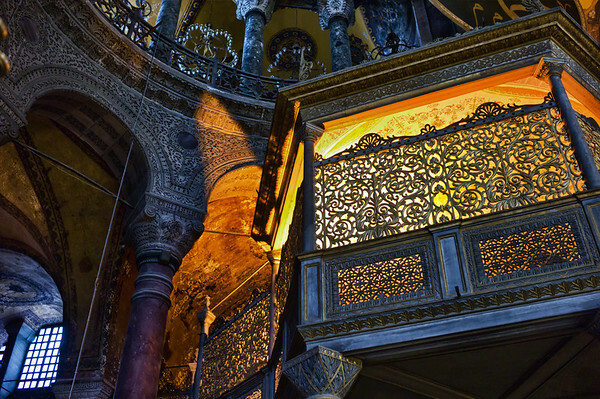 As a mosque, the Hagia Sophia has served as a model for many other great mosques, including the several in Istanbul itself. This scene of the Minbar (pulpit) captured my eye given the light and the detail associated with the railing and screens, as well as the huge mosaics of Arabic words (just barely visible above the Minbar). Sometimes images create themselves. 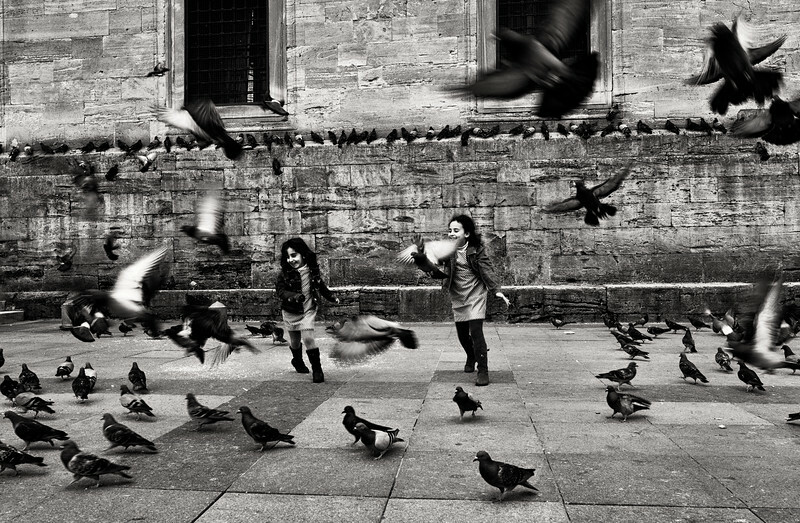 I was exploring the area around the New Mosque (Yeri Cami), near the Grand Bazaar and Galata Bridge in Istanbul, when I came across these two you girls having fun running through the flock of birds stationed outside mosque. A vendor was selling bird food, which attracted the birds, and despite being continuously disturbed by the girls, the birds kept coming back for their food. I shot these girls for maybe 30 minutes, while enjoy the entire scene; the girls where having so much fun and so happy that it made all those around happy as well. 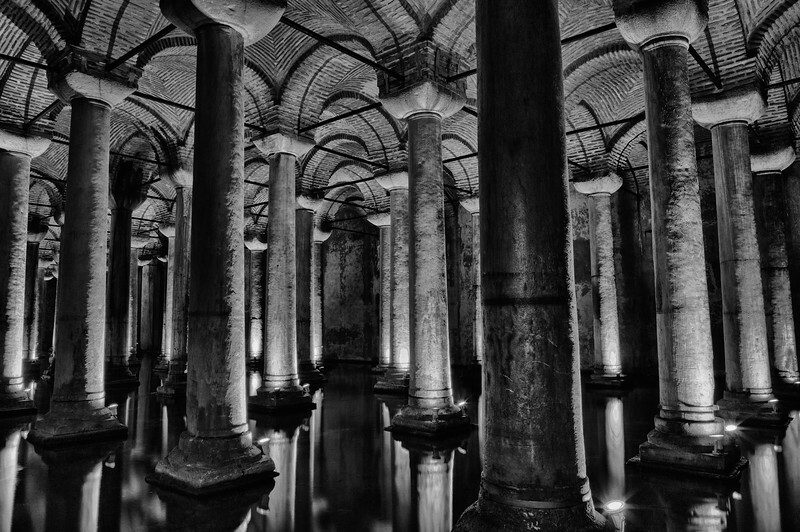 The Basillica Cistern is one of the places in Istanbul that I visited twice; that's how fun it was. After defending stairs into the Earth, visitors are faced with a scene of row after row of columns and arches, all bathed in a warm red light, and reflected in the mirror smooth surface of the water below. It's astonishing to think that such a structure could be built underground over 1,500 years ago. It's extremely hard to photography this cistern because it is so dark inside, and given its size a flash really won't help. The only solution is some kind of camera support and long exposures. I ended using a GorillaPod wrapped around a railing, and lots of long exposures. My hope was that I would get one or two exposures without people walking by and causing everything to vibrate; preserving paid off, and I was rewarded with a few useable frames. 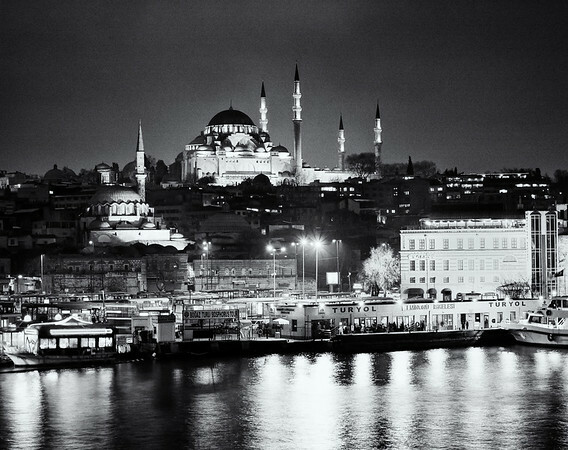 The largest of Istanbul's mosque, The Suleymaniye Mosque overlooks the city from a hill near the Galata Bridge. The mosque is certainly grand, and a pleasure to explore. I captured this image after a long day of walking the streets of Istanbul, soaking up the sights, smells and culture of the great city. 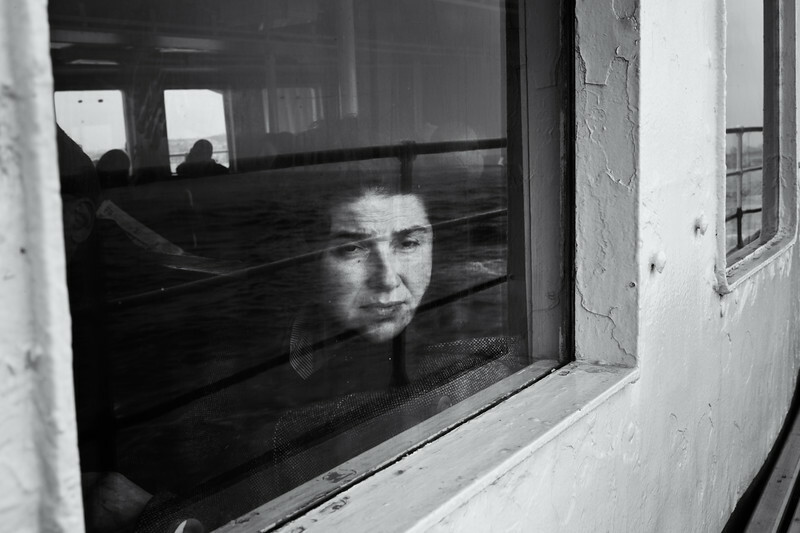 Crossing the Galata Bridge, I was captured by the sight of the great mosque looking down on the city from its high perch. In the foreground is the New Mosque and a portion of the Great Horn's bustling waterside. Mamiya 7ii, 65mm Wide Angle lens, Kodak Portra 400. 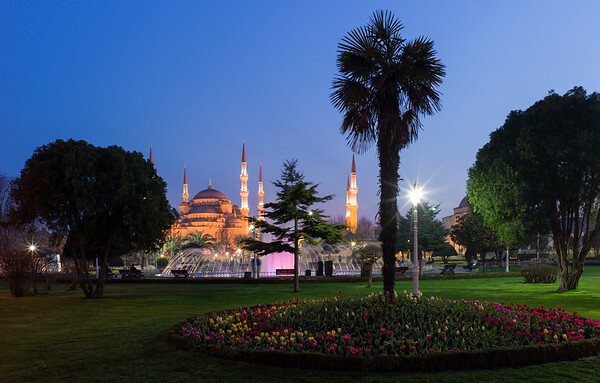 The great Blue Mosque as seen shortly after sunset, illuminated by the lights of the compound and the last remnants of twilight. As Spring was just arriving in the city, the flowers in the park near the Blue Mosque were out in bloom, which provided a nice foreground for this images. While it's not shown in this image, the water of the fountain changes color every thirty seconds or so, which was fun, and a bit mesmerizing, to watch. I thought the pink color was better than the other choices Visiting the Blue Mosque at this time of day was much more relaxing and peaceful, as the buses had long since returned their groups to hotels, and only a handful of people were enjoying the sights that evening. 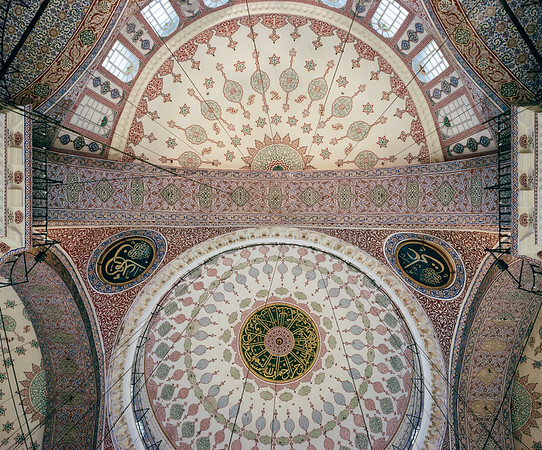 I became fascinated with the ceilings of mosques and churches during this trip. It's often easy to forget to look up to see more instances of architectural grandeur, but such details is plainly visible to those who look. Photographically it was a challenge to capture the ceilings, but I got quite good at positing my camera on the floor or railing, and using the self-timer button to trigger the shutter after I'd moved out of the way. I even used this technique with my film camera, successfully in some instances, such as this one. Mamiya 7ii, 65mm Wide Angle lens, Kodak Portra 400. 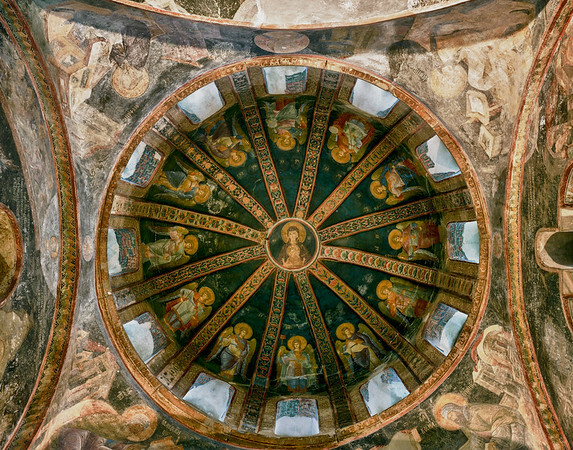 The Kariye Museum (Church of the Holy Savior in Chora) is an incredibly well preserved example of 11th Century building, with most of the interior mosaics dating from around 1320. I remember arriving before the museum opened, and being the first guest in that day. My early arrival ensured I had about 30 minutes to myself inside, which gave me the time and freedom to photography the intricate mosaics that cover the walls and ceilings throughout the church. While not all the mosaics have surveyed, those that have are a sight to behold. The attention to detail and sheer scope of the mosaics rival almost anything else I've seen. In the end, before the first bus load of tourists arrived, I found myself walking the halls soaking in the beauty of these religious scenes. While seeing the Blue Mosque from the outside shows its greatness on a grand scale, seeing the intricate design details once inside shows that greatness also comes in small sizes as well. The intricacy of detail in the ceiling of the Blue Mosque is simply hard to comprehend in a photograph. The repeating patterns and repeating colors are highlighted by the natural light streaming in through the numerous windows throughout various levels of the mosque. Only with this light is the artistic intricacy visible from the floor below. Mamiya 7ii, 65mm Wide Angle lens, Kodak Portra 400. 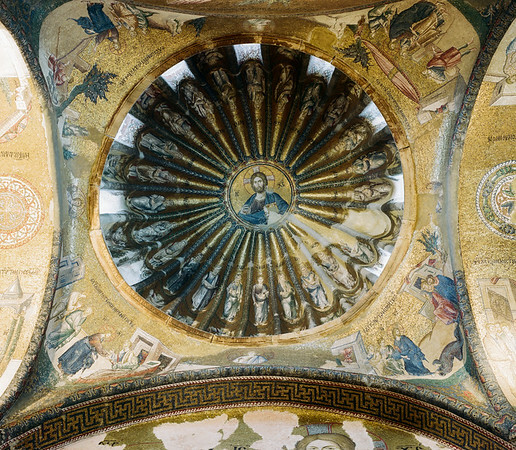 The Chora Museum, or Church of the Holy Savior in Chora, is an exquisite surviving example of a Byzantine church. Most of the current building dates from 1077-1081, and has served as a church, mosque, and now a museum; thanks to a restoration in the mid-20th century, the church and its incredible display of mosaics can be viewed and appreciated. I arrived before it opened, providing the opportunity to explore the church interior without other people; an wonderful experience. I worked my way slowly through the corridors and rooms. Moving without urgency, and able to take time to appreciate what I was seeing, I took a relatively small number of photographs, most of the intricate mosaic ceilings. This image is of the parecclesion, or side chapel, which has the second largest dome (4.5 meters) in the church, and is covered in frecoes. I placed my camera on the floor,, facing straight up, and used the self-timer to take this image. Shooting it on film added to the texture and richness of the colors that comprise this fresco. Mamiya 7ii, 65mm Wide Angle lens, Kodak Portra 400.